Maslow's Hierarchy of Needs Has A Secret Unpublished Layer On Top That Changes Everything! Maslow’s Hierarchy of Needs Has A Secret Unpublished Layer On Top That Changes Everything! The first level are “Physical Needs” like air, water, food, warmth… and if those are not met everything else falls off. The second level is “Safety” meaning that, after we make sure we’ve acquired our basic needs, we seek security of our body, of resources, property, morality, family, health… after these are met we climb to the third level. The third level is “Belonging”. We seek to belong, we crave for friendship, love, intimacy, sense of connection with others. After we establish belonging, the center point of our motivational drive climbs one level higher. The fourth level is “Self Esteem”. We seek achievement in various areas of the community, we crave for confidence and respect. This is where most people get stuck, driven by their egoic nature, forever trying to satisfy their need for respect like filling up a black hole. The ones who manage to establish a solid structure of self esteem inside themselves, ascend to the next level. 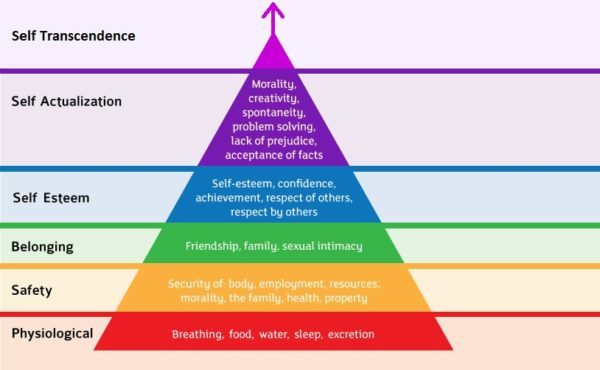 The fifth level is “Self Actualization” and most people consider it to be the highest layer. After establishing a solid structure of basic needs, safety, belonging and self esteem, we seek to find ‘Who we really are?’. We dive deep into our self and hunt for our truth. We seek creativity, spontaneity, we have lack of prejudices and we accept the facts of the world as they are. We try to know ourselves, to master ourselves, to elevate ourselves. For many years people believed that that’s it. That’s where the hierarchy ends. But they were wrong! Abraham Maslow had another piece of this puzzle that he never made public. He passed away before publishing the complete “Hierarchy Of Needs” which had 6 levels. Not an elevation of the self, but a subverting of it. This takes us to different perspectives on human psychology itself. Achieving self actualization means resting comfortably inside the boundaries of human psychology, accomplishing what is knowable and testable, while self transcendence means pushing beyond them. Whether through spiritual meditation, self denial, or more recently through technological means, challenging the definition of consciousness to expand into new areas of knowledge, beyond self knowledge, may be the ultimate stage of human development. Transcending oneself is similar to what advanced meditators tend to describe. When they reach that ascended state they report being ‘everything and nothing at the same time’. This is one way to go with this. Another, more technological path toward self transcendence is the singularity, an event in which human biology and computers become one. This is an opportunity to literally overcome our present physical limitations. Overcoming the narrow confines of the self may be as simple as giving yourself over to others: their dreams, their goals, their passions. And by doing so, you become one with them. Whichever way we choose, it seems that our journey doesn’t end with ‘knowing thyself’ but there is a lot more to embark toward. After we discover our truth, we need to transcend with it. We are like a source for this unique essence. We pour our purpose into The Universe and we need to find ways to transcend without neglecting it. However, what awaits us then, is as mysterious as The Universe and its vastness.